The Hungry Man Challenge: Participants purchase a Hungry Man Meal and bring that meal into work. All the meals are then added to the wheel of destiny. 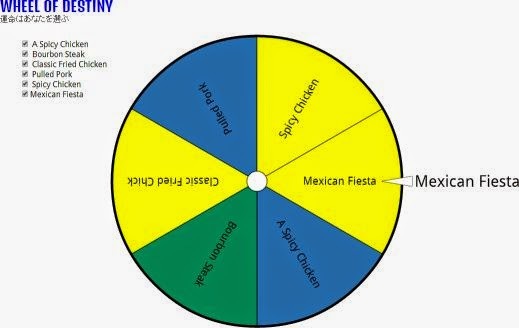 Each person spins the wheel of destiny to see which meal they will consume. After meal consumption a form is filled out to rate the meal. You may be asking who then wins the Hungry Man Challenge. No one really wins a Hungry Man Challenge, except maybe the Hungry Man Corporation and the small bump in profits garnered. 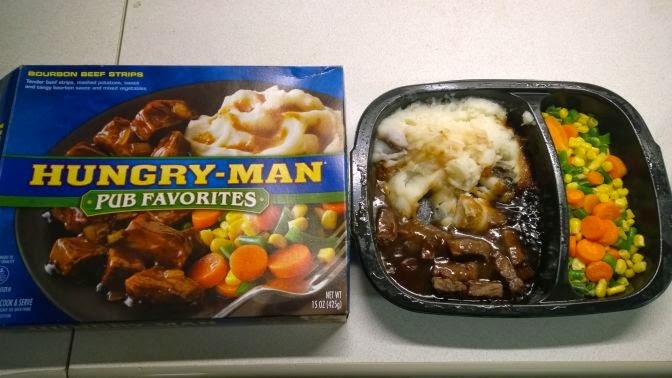 Hungry Man meals, and frozen dinners in general, are not really known for their nutritional value. The table below confirms that thought. The participants completed the following form to rate the meal. 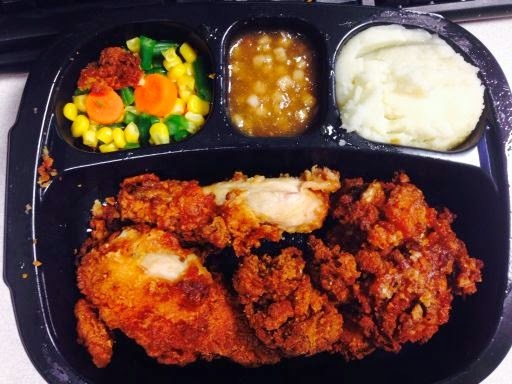 Chicken fared the best in our survey scoring an average of 5.67 taste rating compared to 3.33 non chicken meals. 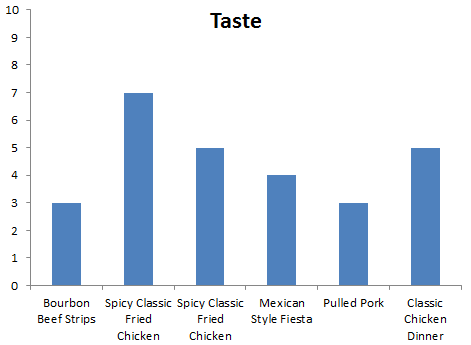 The Spicy Chicken, part of the Selects line, scored the best in taste with a high value of 7 and an average of 6 between the two participants. The Bourbon Beef Strips and Pulled Pork offerings rounded out the bottom of the list on taste. 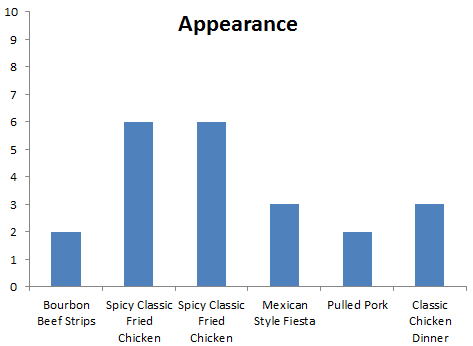 An interesting result in the appearance category is that it closely matches the taste ratings. Chicken again showing its dominance with the Bourbon Beef Strips and the Pulled Pork lagging behind. The Spicy Chicken meals scored the best in taste and appearance. 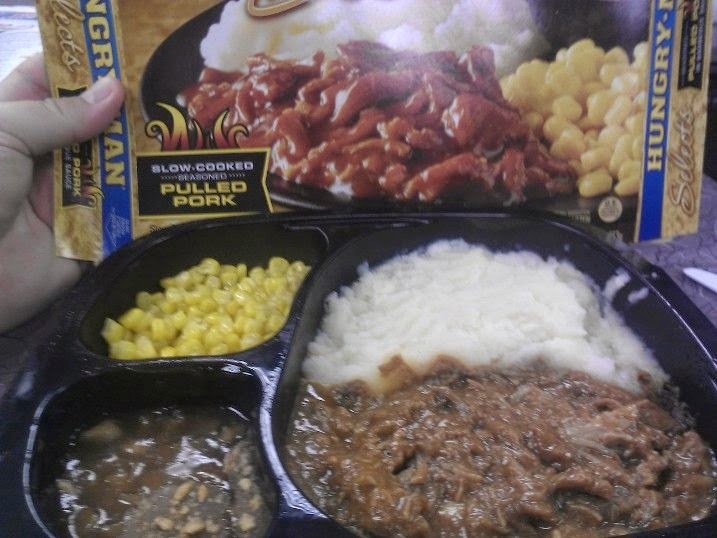 The Saucy meals scored terrible in the appearance category with an average of abysmal 2.3 rating out of 10. How did the end result compare to the picture on the box? Food artist can make just about anything look appetizing. Hungry Man's Food Artist are masters at this. The food on the box actually looks decent, the story changes when you remove the frozen entree from its pleasing to the eye packaging. 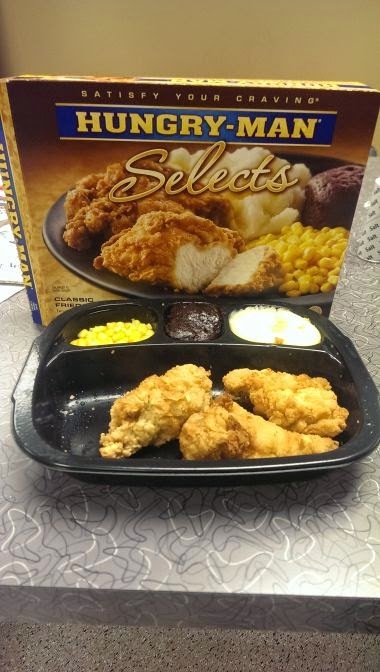 The average rating on how the end result compared to the picture on the box was a brutal 1.67. Again the saucy entrees (Bourbon Beef and Mexican Style Fiesta) were terrible in another appearance category and both scored a 1 out of 5 scale. No surprises here. Every participant answered answered with a 1, meaning not very likely they will eat this meal again. I'd like to caution participants though to never say never. Hungry Man Challenge 2!!! Finally there was a comments section to allow participants to give feedback about the meal. Bourbon Beef Strips: It tasted like a child ate a bag of candy and puked it into the tray. Although the carrots were tasty, it could not make up for the disaster that was the gritty potatoes. Massive failure by Hungry-Man that may result in my quick demise. Spicy Classic Fried Chicken: Chicken flavor wasn't bad, potatoes, "dessert", and vegis were not good enough to warrant finishing the meal. Spicy Classic Fried Chicken: Chicken had good spice. Other sides...not good. Mexican Style Fiesta: Re-fried beans were not terrible. Rice/Enchilada mixture left a little to be desired. The cocada pudding had actual bits of coconut in it, almost leading you to believe it tasted decent. Then you remember you don't like coconut. Pulled Pork: The pulled pork was mostly a sweet BBQ sauce with occasional almost undetectable bits of completely shredded pork containing only 2 actual chunks of pork about a half inch long. Classic Chicken Dinner: Corn was good, brownie was bitter, potatoes were still powdery. The chicken was very inconsistent. The meat was perfect on one, rubbery on the other. The breading was nasty.